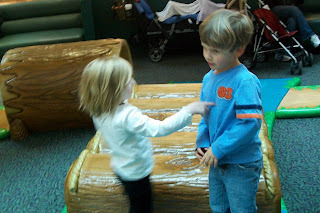 While we were playing at the tree in The Woodlands Mall, Dawson made a sweet little friend (pictured here). She was running around calling him "friend" and had fun playing lion with him. She wanted him to be the "nice daddy lion" and she would be the nice mama lion. I just thought how differently this game of playing lion was than the one Dawson had recently played at our neighborhood park with a bunch of boys. With this little girl, it was sweet, just roaming around, crawling on their hands and knees, roaring a little. But at the park with the boys it was much more aggressive. Whoever was deemed the lion, ran around, roaring loudly, chasing and swatting the other kids. I think I much prefer the sweet lion game this little girl wanted to play.